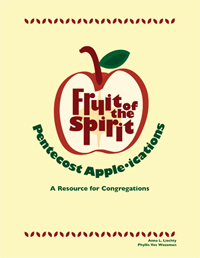 This book offers congregations a thematic approach for communicating the message of Pentecost, as well as the period of the Church Year known as Ordinary Time (or the Sunday's After Pentecost). The symbolism of an apple is used to focus on the theme of the nine Fruit of the Spirit listed in Galatians 5:22-23. Beginning with Pentecost Sunday, the apple symbol represents the gift of God's Spirit to all believers. Then through the next nine Sundays, a variety of apple-ications represent love, joy, peace, patience, kindness, generosity, faithfulness, gentleness, and self-control. The apple-ication keeps the listeners intrigued with a memorable symbol that appeals to the senses. Ten sessions: Worship (including Children's sermons), Nurture (families), Education (Sunday school sessions) and Enhancements (reproducible designs for banners, posters, etc.). Makes a great summer program! Can even be done as an intergenerational fun time during coffee hour.